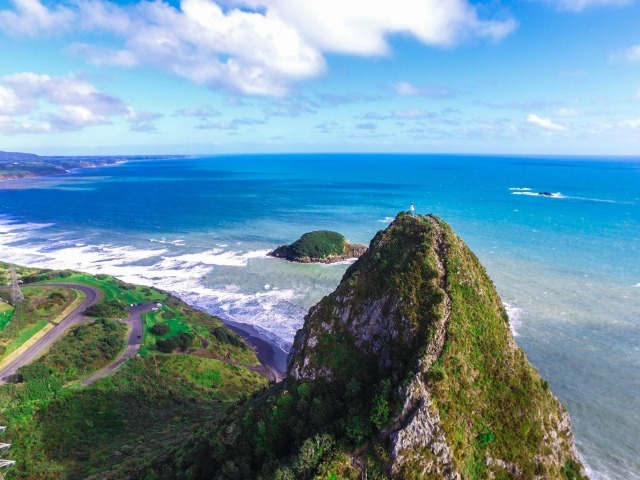 Standing proudly on the coastline of New Plymouth, between Back Beach and Ngamotu Beach boasts ​Paritutu Rock​​. At 156 meters tall, this ‘rock’ is an iconic sight in the New Plymouth landscape. 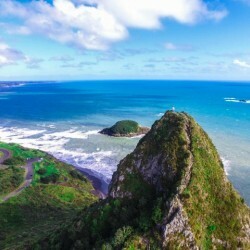 The remnants of an ancient volcanic crater which was active approximately 1.75 million years ago, ​Paritutu Rock is kept company by the seven Sugar Loaf Islands, also remnants from the volcano. It was discovered in 1770 by Captain Cook, and was first occupied by Māori, who flattened the summit in order to make shelters and kumara storage pits. Paritutu Rock and the Sugar Loaf Islands became a marine reserve in 1986. Fish, sponges and even seals call the spectacular waters their home, and on the odd occasion dolphins and whales can be seen swimming by. ​The carpark is sign posted off Centennial Drive in New Plymouth, a short drive from the CBD, or walk to it from the Coastal Walkway. To climb ​Paritutu Rock will only take 15 minutes at an average pace. But don’t let the short time frame fool you. Climbing the 100 meters almost vertically is more of a thrill than an easy Sunday stroll. You’ll begin your journey somewhat gently up a wooden staircase. Shortly after, the climb gets more demanding and you’ll need both hands free to maneuver yourself up the side of ​Paritutu Rock. ​​This part resembles more of an easy rock climb than a walk. There is a chain along side you to hold onto, so although the surface is quite rocky, it is safe and the novelty is exciting. Make sure to stop, take a breather, and enjoy the phenomenal views as you go. The challenge of the hike is, of course 100% worth the energy once you reach the ​Paritutu Rock summit. The 360° view is a sight to be admired. Enjoy the ample view of New Plymouth city below, while Mt Taranaki stands proudly in the distance. Continue your scan around to the long black sand of Back Beach and the best view of the seven Sugar Loaf Islands, which are scattered in the outstretched ocean around Paritutu Rock. Next to these, you’ll see the Taranaki port and Ngamotu Beach. On a clear day you will be able to spot the North Island’s Central mountains, Mt Ruapehu, Mt Tongariro and Mt ​Ngauruhoe​. If you’re an early bird, the view at sunrise is something else. After your descent back down, enjoy the rest of your day at Back Beach, a popular spot for surfers, and have fun running up and sliding down the sand dunes. On the other side of Paritutu Rock is Ngamotu Beach, a family friendly, safe swimming beach. ​If you are after a closer view of the Sugar Loaf Islands, charter companies tour the islands, or there are diving operators who can take you up close to the underwater life. Sturdy footwear is a must as the track is uneven and rocky in parts. A bottle of water and comfortable clothing are recommended, and on a windy day a jacket will be needed once you reach the top. The Paritutu Rock track is suitable for athletic older children, however it is not recommended for younger children or toddlers. Although the climb is short, it is relatively challenging and a good level of fitness is required. No, Paritutu Rock is free to hike.